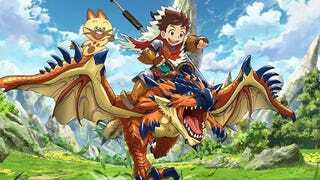 Capcom has revealed that the Anime adaptation of the Monster Hunter SPinoff, Monster Hunter Stories: Ride On, will come the same day the game comes out, October 8. On the same note, the game will have some Amiibos (I want those!) where the first three (Female/Male Rider with One eyed Rathalos and the Felyne) will release on October 8, more Amiibos will come in the future. There are other information regarding the fact that if you have Monster Hunter Generations (Out in July on North America) you will get some clothes and weapons. Monster Hunter Stories is an RPG Spinoff of Monster Hunters, where youa re a Raider, someone who instead hunting and killing Monsters,decides to raid them and befriend them. The Game is for Nintendo 3DS.